NAVAL AVIATION CADET SELECTION BOARD 1210 BRYANT BUILDING 11TH & GRAND AVENUE KANSAS CITY, MISSOURI January 8, 1942 Mr. Robert Hogan, The Cedar Rapids Gazette, Cedar Rapids, Iowa. 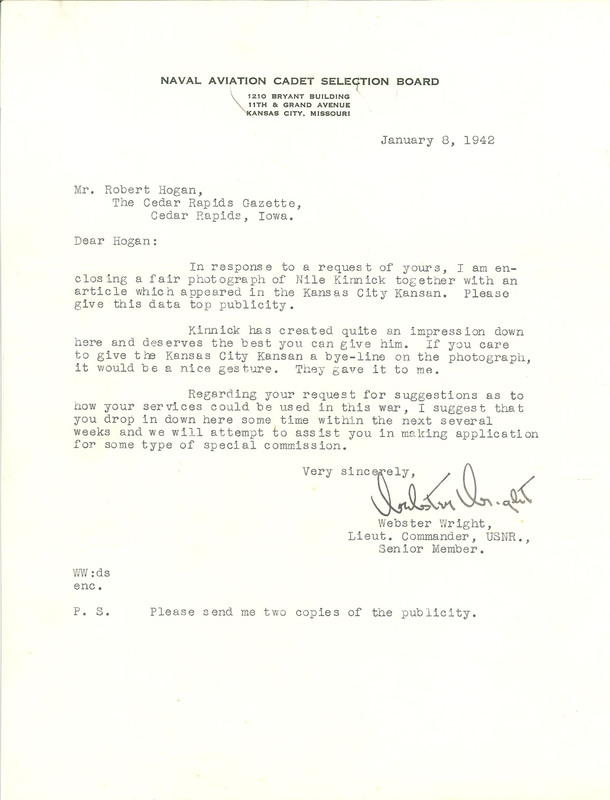 Dear Hogan: In response to a request of yours, I am enclosing a fair photograph of Nile Kinnick together with an article which appeared in the Kansas City Kansan. Please give this data top publicity. Kinnick has created quite an impression down here and deserves the best you can give him. If you care to give the Kansas City Kansan a bye-line on the photograph, it would be a nice gesture. They gave it to me. Regarding your request for suggestions as to how your services could be used in this war, I suggest that you drop in down here some time within the next several weeks and we will attempt to assist you in making application for some type of special commission. Webster Wright, Lieut. Commander, USNR., Senior Member. WW: ds enc. P. S. Please send me two copies of the publicity.